Tweetbot If users are one of the many Twitter clients for iPhone's, you should know that it has released a mandatory update to adapt the application to the Twitter API 1.1. What does this mean? That the visual interface has been slightly adapted to address these changes and most importantly, we have to upgrade before March 5 or the application will stop working, precisely because versions prior to 2.7.2 Tweetbot are not compatible with the new Twitter API. Although we are in iPhone News, this story also extrapolates existing version Tweetbot for iPad and OS X. Now available all relevant updates to avoid thrown stay from March 5. Multiple timelines. Quickly change your main timeline from their lists. Smart Gestures. Use Twitter more efficiently with time-saving gestures are configurable. Navigation customizable. The last two tabs are customizable and unused tabs are easily accessible. Save drafts, add locations and POI, attach images and videos, manage your lists, and much more. If you do not know what Twitter client for iPhone choose among the many that are in the App Store, you can see the collection of social network applications for blue bird we published a few months ago. 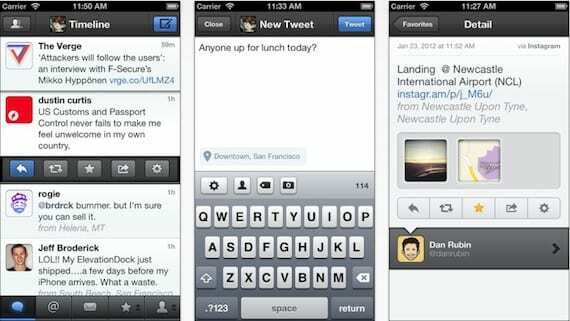 Article Tweetbot is updated to address the new Twitter API was originally published in News iPhone .